I finished painting this unit on December 2nd, and it took place in the Austerlitz game. I just hadn't had a chance to do a post on it until now. While the Austruian army probably lead Europe in Light Infantry tactics during the 7 Years War, thanks to their Grenz troops, the attempt to convert them into something closer to line infantry resulted in a notable decline in their effectiveness at skirmishing and raiding activities. In 1798, 15 battalions of Light Infantry were raised from several existing units of Freikorps. Their existence was short lived, being disbanded in 1801. Their uniforms are rather interesting, so I will present the basic information on these units. Jackets were essentially the same cut as for the line infantry, but were "pike grey" (Hechtgrau)in color. This is a blue grey, with the emphasis more on the blue than the grey. The top bar of the table of facings is as close as I could come for the hue. There is an excellent presentation of what the various Austrian facing colors probably actually looked like here. The units recruited in Italy had "German" pants with gaiters, while the rest had the tight pants yellow braid and short ankle boots of Hungarian units. In either case, the pants were Pike Grey as well. The facing colors appeared on the collar, cuffs, turnbacks, and the piping of the shoulder straps. It seems that the Italian units also had round cuffs and the rest (mostly) pointed cuffs in the Hungarian style. The helmet was worn as for the line infantry of the time, but with a brass "F-II" cipher on the front instead of the usual brass plate. 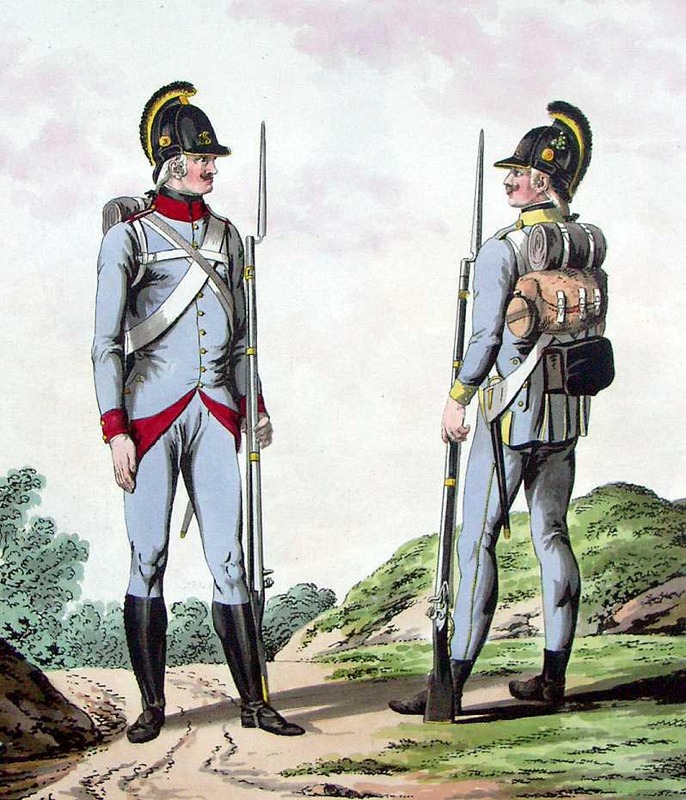 Austrian Light Infantry, 1798, by Tranquillo Mollo. When the Light Infantry were disbanded in 1801, their place was taken by 3 battalions of Jagers. Originally, these were part of IR 46, but were reassigned as IR 64, and named the Tiroler-Jager Regiment. When the Tyrol was lost in the treaty of Pressburg following Austerlitz, it was restyled the Jager-Regiment Chasteler. The initial uniform was similar to that of the earlier light infantry, with hechtgrau jackets and pants, grass green facings, and all black leather work, topped by a helmet with a green crest. I will be discussing the 1808 uniform in another post; this small unit of 12 Old Glory 28mm figures has a sister unit of 18 yet to come. I will note that I opted for the more traditional medium grey color these rifle armed Jagers are usually depicted in, rather than the bluish, proper hechtgrau shade. Timing is everything, Peter! By coincidence, I have two battalions of these Austrian Light Infantry ready to muster off from the painting table! Moist excellent, Jon. I look forward to the "film at eleven"! One of my favourite outfits of all time! I actually have a helmeted Jager battalion in my collection/Austrian army. Just got in some of the Perry castings of the jagers, which wear the Coreshut. Blue-grey eh? Marvelous! I'd say about Delta CC "Wedgewood Blue" would be a good approximation of "Hechtgrau". next time you visit the craft store, take a look at TPB and see what you think. Haven't seen that one before. Michael's swirtched to carrying their own (inferior quality) brand of craft paints, but there's another craft store in Ithaca that still caries Delta CC; I'll have to check it out the next time we're up there! Lovely looking animated jagers, what is it? Is austrian light infantry catching? It must be the season! "Jagers sniping at my nose?" Yikes! Good reason to stay in out of the cold! und Volk dressed up with dark green bows! may make it hard to sleep tonight! so like good Kaiserlicks, they're gonna fly! Vive l Empereur, to you! These are probably my favorite type of post from you Peter! I really could have used this a couple years ago. Glad you enjoy them, Jake. As you know, developing a fairly comprehensive (in breadth) basic uniform reference database for the Napoleonic Wars was and remains one of my key objectives for the blog! Excellent info and great looking figures. Nicely done Peter. I think the jagers are my favourite Austrian unit, and they certainly account well for themselves in the games we play. Thanks, Lawrence. They just needed about 3 times as many of them! I very much enjoy these "unit History" style posts you do Peter. Also the jagers are one of my favourites. Thanks, David; glad you enjoy them! The trouble with seeing an army so well planned, photographed, painted and described I have to try to field an Austrian Army. Just when I thought the world had become feldgrau an khaki. Seriously, the Austrians are second only to the French as my favorite Napoleonic army.